Does your B8 A4's ride height have you feeling a bit light-headed? Come back down to earth with a FK Highsport coilover system. These coilovers are an excellent mid-level suspension option. Made in Germany to stringent specifications and featuring zinc-plated steel housings, they passed Air Audi landing gear inspection with flying colors. Blue and yellow powdercoating, to be specific. Direct bolt-on fitment will have you quickly adjusting your altitude and giving your Audi more attitude. You are now free to drive about the country. 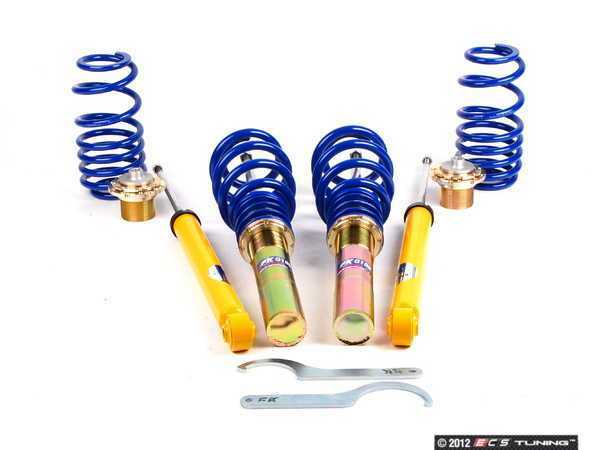 This coilover kit will lower your car approximately 1.2'' to 2.4''. **Vehicles equipped with Electronic Damping Control (EDC) will lose shock dampening and receive a system error code with coilover systems. Audi B8 A4 (09+) Sedan Models Only. Quick Reply: :: ECS Tuning :: B8 A4 FK Coilovers - FREE Shipping! !